Sounds in the game are similarly sufficient, the highlight being the character's voices. They are the sort of maniacal jibber-jabber you'd expect, but as a nice touch, they call out to each other by name. I found myself picking on Fatty, just to hear his moronic wails for revenge. The music and sound effects also fit the tropical, cartoony theme - injecting the appropriate "boink!" and "smack!" when needed. Ooga Booga is quite an easy game to pick up and play. The controls are pretty tight, and everything generally behaves as you'd expect it to. I'm glad Visual Concepts included the ability to choose between Automatic or Manual camera, though. While the system does a decent job of tracking your character, switching to manual allows for faster turns - and in a game like this, speed is vital. 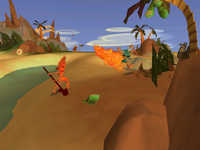 Ooga Booga can be played alone, or with up to 3 other friends (offline and online). 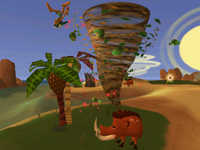 Tribal Trial is the game's single player mode. It breaks down the game's weapons, techniques, and modes of play into various tutorials. After completing each lesson, there is usually a "free for all" match, letting you test your new skills in a real-game environment. Some of the lessons can be a little boring, but generally the Tribal Trial is a good challenge. In Offline Skirmish, 1-4 players can duke it out in the game's various events. Weapons, Animals, and stages can be selected and included, depending on which you have unlocked through the Tribal Trial missions. The game plays in split-screen, and although the frame-rate drops to around 30fps, it still runs smoothly and never hinders gameplay. At times, visibility can become a little difficult, but the problem is remedied somewhat by setting the camera further away from your character. While Ooga Booga is definitely a fun game to pick up and play for a while, a number of annoying elements present themselves quite quickly. First off, the island arenas themselves are extremely small. This isn't Quake, where you can hide behind objects, or sneak up on enemies. Because of this, there is very little actual strategy required to play Ooga Booga. That's right folks, welcome to Button-Mashing Central. The pacing is similar in ways to the PowerStone series, except that in PowerStone the environments are far more interactive and, well, interesting. Another fault occurs when your character ends up in the water surrounding the island. You see, while you are frantically trying to get back on to shore, you are still vulnerable to attacks, but unable to retaliate yourself. An enemy Kahuna can simply stand by the waterside, continually pummelling you further and further toward a watery grave, until they run out of ammo (or patience). It would have made more sense to bring back the classic "5 seconds of invincibility after you're hit" rule. Overall, Ooga Booga is a fun, well-made game with a few annoyances that keep it from being truly great. A concept like this really deserves a sequel, and I'd love to see what Visual Concepts could do if they pushed the idea further. That said, the game is enjoyable, and a good deal at its lower price point. The graphics are smooth and clean, the controls are tight, and the characters are pretty funny. It won't blow your mind, but it's good fun while it lasts. Try it! Highs: Super-fast gameplay, great frame-rate, unique concept with entertaining characters. Easy to pick up and play. Lows: Players are vulnerable while in water, island arenas are too small and simple to allow for much strategy. Difference between experienced/new player is negligible. Comments on this review? Mail Feedback or talk about with others in the Forums.